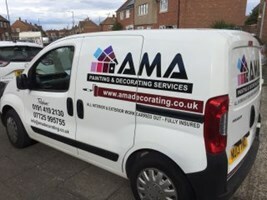 AMA Painting and Decorating Services - Painter/Decorator based in Washington, Tyne and Wear. Professional painter & decorator services based in Tyne & Wear. AMA are your local painters & decorators - providing affordable services to domestic and commercial customers throughout the North East. Our local painters and decorators are dedicated to providing the highest quality standards in work, service and safety. Each project is overseen and managed from start to completion. With AMA Painting & Decorating Services, customer satisfaction is guaranteed.